All our ibs Solutions support n-tier, multi-browser (Microsoft IE, Mozilla Firefox, Chrome) web applications based on Model View Controller 2 using Struts as a framework. The core of this architecture is Spring, a full-stack Java/J2EE application framework. It delivers significant benefits to our applications and reduces development efforts while improving test coverage and quality. 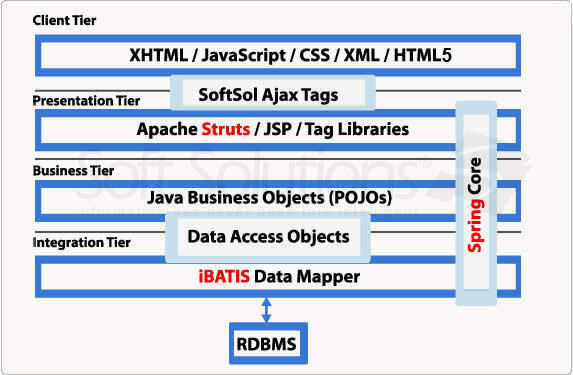 We use the iBATIS data mapper framework to map classes to SQL statements using an XML descriptor. With iBATIS we can map any database to any object model. This layer uses POJO's (Plain Old Java	Objects). With POJO's, the Spring framework acts as a lightweight container providing optimum performance. 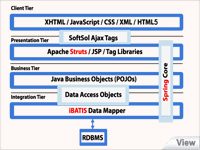 This tier is supported by iBATIS SQL Maps, which provides a very simple and flexible means of moving data between	our Java objects and a Relational Database. This Data Mapper framework helps to significantly reduce the amount of Java code that is normally needed to access a relational database, thus optimizing performance again.